There is a wide range of timetabled, internal and external sport and exercise opportunities at Derwen College. Our indoor heated swimming pool, sports hall, dance studio, fully equipped gym and football field provide many sport opportunities on-site. Students have the opportunity to take part in basketball, boccia, dance, football, rounders, netball, walking, new age kurling and swimming. 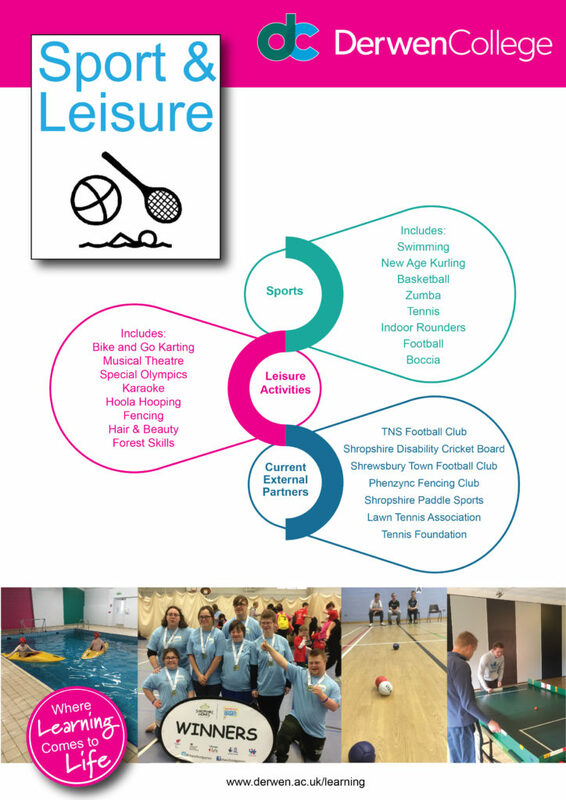 With strong links to community clubs and organisations, external sport and exercise opportunities are also available. Learn how to swim, develop your water skills and work towards Amateur Swimming Association (ASA) recognised distance awards. There is also the annual Swimming Gala in the summer term to take part in which is great fun. The college plays in the 3 Counties Football League, North Wales Pan Disability league and partners with Chester FC Community Trust. Derwen College also works with Shrewsbury Town FC, current Welsh Premier League champions The New Saints, and Chester Football Club. 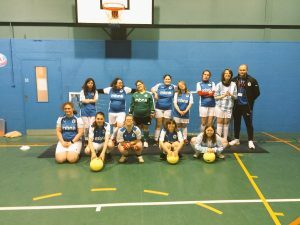 The college’s female football team (Derwen Devas) benefit from a weekly training session from Chester Football Club coaches. The female team have played at the King Power Stadium, home of Leicester City FC. Some of our students also play football for the Shrewsbury Town Down Syndrome team. Through North Shropshire Special Olympics weekly groups attend boccia, swimming, badminton, table tennis and athletics sessions. Students get the opportunity to complete in these sports as well as skiing. Derwen College is also proud to have strong links with Shropshire Cricket Board, Shropshire Paddle Sports, Phenzync and The Tennis Foundation/LTA. These activities, along with the Duke of Edinburgh Awards, provide further opportunities for the students. Various indoor activities take place in the Student Union including table football, skittles and the Nintendo wii. All students are encouraged to choose a timetabled sport. However there are also lots of extra sport clubs and activities available during the evenings and weekends.